J and I wrapped up our week of wedding planning in Illinois by picking out the tuxedo’s. 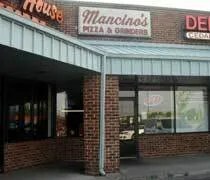 I wanted to go to a regional chain in Bradley, IL at Northfield Square Mall because all of the guys in the wedding live pretty close to one of the locations. As we entered the mall, the first thing J noticed was an ice cream store. When I was growing up, that location was a Baskin Robbins. Not anymore. Did you know Hershey’s made ice cream? Me neither. Fact is, they don’t. 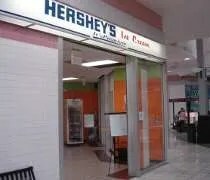 Until I made my way to Hersheysicecream.com, I would have assumed they were affiliated with the famous candy company, but, in small print, on the bottom of the website are the words “not affiliated with Hershey’s Chocolate.” They had me fooled. I have a love/hate relationship with Oberweis. I love their milk and ice cream. I hate their owner. 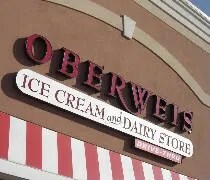 Jim Oberweis is a name every Illinoisan knows. It would be hard not to. He’s ran for and lost just about every public office in Illinois. He’s the king of saying something stupid and can’t make it out of a primary. Usually, he does more damage to the Republican party by running a smear campaign in the primary that gives the Democratic challenge in the general election a head start. Case in point, the last gubernatorial election. He ran a smear campaign against rival GOPer Judy Bar Topinka showing her dancing with incarcerated former Governor George Ryan. He called it, “The Pay-To-Play Polka.” When he lost the primary, Topinka’s Democratic opponent and incumbent, Rod Blagojevich started using the same video and same tag lines against Topika driving home the connection to her and Ryan. Blagojevich won and now Illinois is the political laughing stock of the country. There aren’t many chain restaurants that I miss, but Taco John’s is one of them. 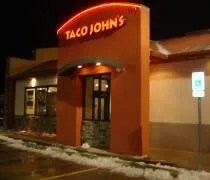 Everyone always thought I was crazy for preferring Taco John’s over Taco Bell, but I loved Taco John’s. When I was growing up, they used to give free tacos for A’s on your report card. You’d bring in the report card, they’d give you a taco then mark the report card so you couldn’t try to use it again. As stupid as it sounds, it was always an incentive to get A’s. We knew if we did, we get a trip for tacos. Once we got too old for that, we would always hit up the store on Tuesday for “Taco Tuesday” All tacos were half price and my mom could feed two growing boys for half price. Not a bad deal. 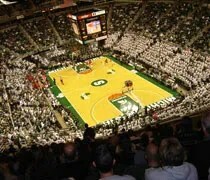 A year ago, when I stood in the Peoria Civic Center and watched Bradley University almost upset Michigan State, I never imagined that I would see this year’s Bradley/MSU from a seat in the Breslin Center. Earlier in the week, J and I made sugar cookies like we do every year from my grandma’s recipe. She took a few to work and one of her co-workers said he’d like some more. He’s got access to MSU basketball tickets and I offered up a trade. Two dozen home made sugar cookies for two tickets to the Michigan State vs. Bradley basketball game. I lived up to my end of the bargain and two days later, J came home with a pair of tickets. I have been to a number of college basketball games, but surprisingly, never as a spectator. I do a lot of work for sports networks that broadcast these games and that’s how I usually go…including last year’s MSU/Bradley game that was aired on ESPNU. I had been to the Breslin Center one other time, but that was for a volleyball game earlier in the year, so I was really looking forward to getting to go to a game. J had never been to a college basketball game either, so it was a treat for both of us. 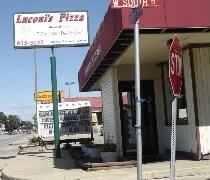 Kankakee is the closest big town comapred to the tiny town of 750 people where I grew up. People who live in that small town, work in the Kankakee/Bradley/Bourbonnais tri-city area and they do a majority of their shopping, entertaining and dining out there as well. For the longest time, I had the same complaint about Kankakee that I did about Lansing. There was no good barbecue joint. That finally changed at the beginning of 2008. A girl I went to high school with and her husband opened up the first BBQ joint in the area that I’m aware of. They turned an old building near downtown Kankakee into a great Memphis style smokehouse. I made my first trip to Bull’s just after it opened with my brother. At that time, I had a few complaints, but loved the BBQ. My girlfriend and I were heading from her parents in Chicago to mine south of Kankakee for a weekend of drinking and catching up with old friends. 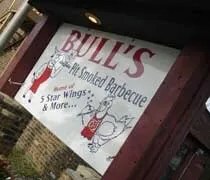 Along the way, I wanted to stop and try Bull’s again to see if the little things I didn’t like had improved.